In Tibetan astrology, there is a twelve year cycle. Each of these years is characterized by a different animal and associated with one of the five elements. Therefore, a full cycle of the twelve animals being associated with each of the five elements takes sixty years. The twelve animals according to the Yungdrung Bön texts are the Rat, Elephant, Tiger, Rabbit, Dragon, Horse, Snake, Sheep, Garuda, Monkey, Dog and Pig. Each animal is associated with a specific element for its life-force as well as a specific direction which is determined by the life-force element. Not only are these twelve animals associated with a particular year, they are also associated with particular months, days and hours. 2011 was the year of the Rabbit. Therefore, people born during this year would be a Rabbit and would have an emphasis of the specific qualities associated with Rabbit. (It is important to remember that this year corresponds with the Tibetan lunar calendar which begins somewhere between February and mid-March each year.) 2011 was also governed by the element of Metal and was a female year. So, people born during this year would be a Female Metal Rabbit. 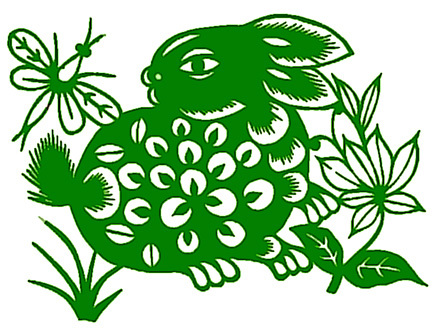 The element which governs the life-force of the Rabbit is Wood and its direction is East. So, if a Rabbit person wanted to strengthen their life-force, they would focus upon strengthening the element of Wood internally and externally. Although called ‘Wood’ in the astrological context, the element of Wood corresponds to the element Wind. The positive direction is East. So, facing this direction while meditating, doing healing rituals or just relaxing and taking deep breaths is beneficial. In general, the Rabbit is considered to be peaceful and calm, virtuous and sensible. The Rabbit has a natural skill for diplomacy and is kind and polite in its interactions. The Rabbit enjoys elegance and comfort and will protect its peaceful environment from disruption. Preferring harmony, it will make an effort to avoid conflict and confusion perhaps giving the impression of indifference and aloofness. However, if the Rabbit feels directly threatened, its anger is expressed through subtlety and cleverness rather than outbursts. The Rabbit’s soul day is Thursday and the life-force day is Saturday. These are the best days for beginning new projects and activities that are meant to increase or develop something. The obstacle day is Friday. This day is best for cleansing and letting things go. It is not a favorable day for beginning new things. Posted on September 23, 2014, in Tibetan Astrology, Uncategorized and tagged astrology, five elements, lunar calendar. Bookmark the permalink. Leave a comment.